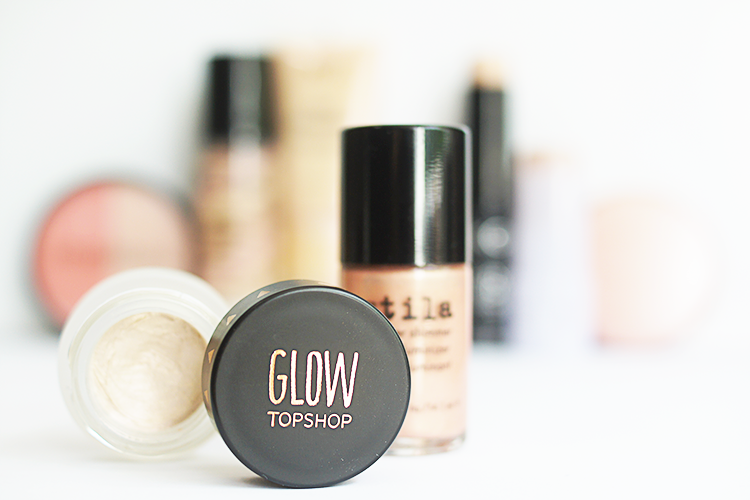 Beauty Favourites, Best Affordable Highlighters. Even though summer is over (boo hoo hoo sob), a little radiance has never gone amiss. Glowing skin looks just as good on a balmy evening with drink in hand as it does over a cosy, candlelit dinner, in from the cold. And you can 'glow' for broke on any budget! 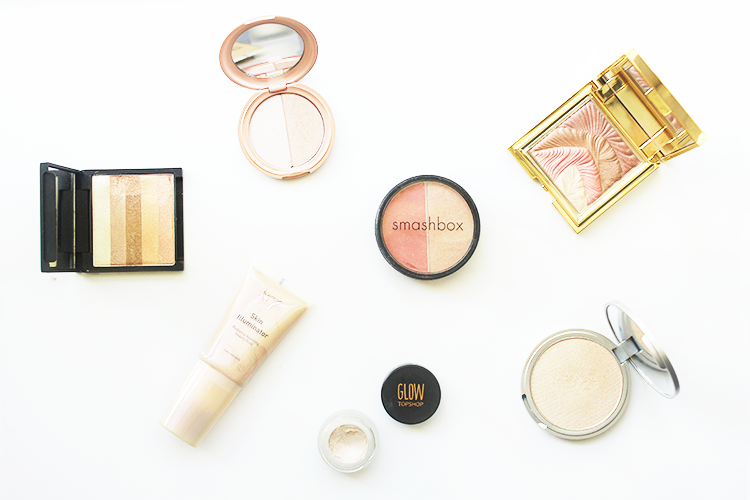 Here are some of my most favourite highlighting products that promise not to break the bank. The Balm Mary Lou Manizer - Especially with a yellowish/olive undertone, you can't go wrong with this highlighter. It's champagne iridescence and creamy powder formulation give you anywhere from natural sheen to full on glow, depending on where and how you apply it. I love using it in my inner corners too to bring my eyes some light. Stila All Over Shimmer Powder in Kitten - I couldn't be more positive than to say I can't ever get enough of Kitten (I think I own it in at least 5 variations???). Stila give you both a pale pink and rosy gold shade in this little compact, which I both use separately or swirled together. With the finely-milled formula, you can't really go wrong. Topshop Glow Pot in Polish - A gorgeous creamy highlight that has a very subtle pinkish/purpley shift, it catches the light beautifully and, thanks to it's pearlescent finish, looks really natural. 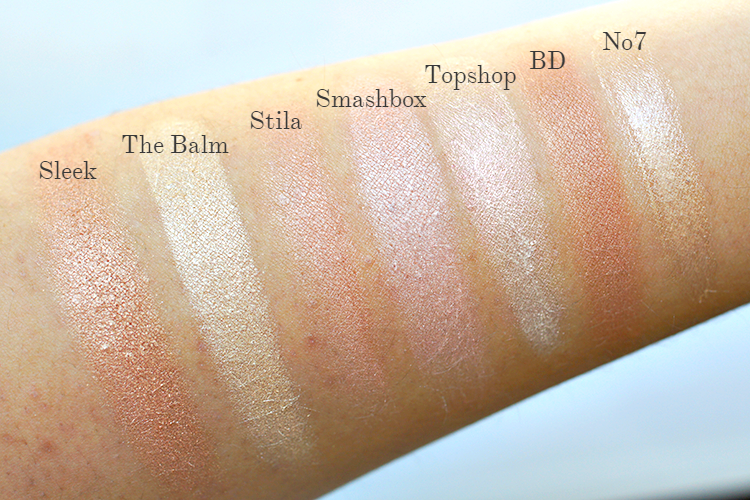 Smashbox Soft Lights Duo - Not only do you get a very pretty, warm pinkish highlight, but also a lovely blush. BD Dream Shimmer - The prettiest, shell-embossed quad of powder hues. You can check out my full review here, it's such a steal. Sleek Highlighter - A great alternative to the Bobbi Brown Shimmer Bricks, the Sleek palette offers you 5 shimmery colours for use as blush, highlight or eyeshadows, depending on how you mix them; I like to swirl down the right side and keep the left side separate. No7 Illuminator - It's fair to say that I hate the packaging. The built-in brush is unhygienic and wastes product but the liquid gold inside is so wonderful I'll endure the irritation. 'Radiance boosting beauty fluid' is right on the money, it blends out to the most beautiful, undetectable, champagne sheen. It's a huge statement but it's possibly my favourite formula/finish. Do you lust after highlighters?? You must let me know your favourites! I saw the Top Shop highlighter a few months back and I thought it was beautiful! Love the Stilla one! I have another great one from Other Stories! Should give it a try!